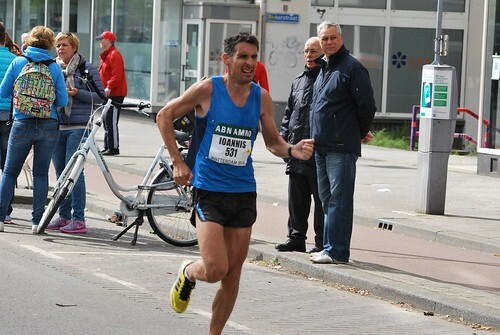 This is a photograph from the 34th ABN AMRO Marathon Rotterdam which was held in Rotterdam, The Netherlands on Sunday 13th April 2014 at 10:30 (CET). This photograph is one of a larger set of photographs which were taken at the start, the 17 mile mark, and the finish of the marathon. The official website of the Rotterdam Marathon is at www.marathonrotterdam.org/. Please note: These are completely unofficial photographs. These photographs or their Flickr set are in no way affiliated with the ABN AMRO Marathon Rotterdam or any of it's partners. We use the Creative Commons Attribution-ShareAlike License for all our photographs here in this photograph set. What does this mean in reality? The explaination is very simple. Attribution- anyone using our photographs gives us an appropriate credit for it. This ensures that people aren't taking our photographs and passing them off as their own. This usually just mean putting a link to our photographs somewhere on your website, blog, or Facebook where other people can see it. ShareAlike – anyone can use these photographs, and make changes if they like, or incorporate them into a bigger project, but they must make those changes available back to the community under the same terms. Can I use these photographs directly from Flickr on my social media account(s)? Yes - of course you can! Flickr provides several ways to share this and other photographs in this Flickr set. You can share to: email, Facebook, Pinterest, Twitter, Tumblr, LiveJournal, and Wordpress and Blogger blog sites. Your mobile, tablet, or desktop device will also offer you several different options for sharing this photo page on your social media outlets. We take these photographs as a hobby and as a contribution to the running community in Ireland. Our only "cost" is our request that if you are using these images: (1) on social media sites such as Facebook, Tumblr, Pinterest, Twitter,LinkedIn, Google+, etc or (2) other websites, blogs, web multimedia, commercial/promotional material that you must provide a link back to our Flickr page to attribute us. This also extends the use of these images for Facebook profile pictures. In these cases please make a separate wall or blog post with a link to our Flickr page. If you do not know how this should be done for Facebook or other social media please email us and we will be happy to help suggest how to link to us. How can I download these pictures to my computer or device? You can download the photographic image here direct to your computer or device. This version is the low resolution web-quality image. How to download will vary slight from device to device and from browser to browser. However - look for a symbol with three dots 'ooo' or the link to 'View/Download' all sizes. When you click on either of these you will be presented with the option to download the image. Remember just doing a right-click and "save target as" will not work on Flickr. How can I get full resolution, print-quality, copies of these photographs? If you just need these photographs for online usage then they can be used directly once you respect their Creative Commons license and provide a link back to our Flickr set if you use them. For offline usage and printing all of the photographs posted here on this Flickr set are available free, at no cost, at full image resolution. Please email petermooney78 AT gmail DOT com with the links to the photographs you would like to obtain a full resolution copy of. We also ask race organisers, media, etc to ask for permission before use of our images for flyers, posters, etc. We reserve the right to refuse a request. In summary please remember when requesting photographs from us - If you are using the photographs online all we ask is for you to provide a link back to our Flickr set or Flickr pages. You will find the link above clearly outlined in the description text which accompanies this photograph. Taking these photographs and preparing them for online posting does take a significant effort and time. We are not posting photographs to Flickr for commercial reasons. If you really like what we do please spread the link around your social media, send us an email, leave a comment beside the photographs, send us a Flickr email, etc. If you are using the photographs in newspapers or magazines we ask that you mention where the original photograph came from. I would like to contribute something for your photograph(s)? Many people offer payment for our photographs. As stated above we do not charge for these photographs. We take these photographs as our contribution to the running community in Ireland. If you feel that the photograph(s) you request are good enough that you would consider paying for their purchase from other photographic providers or in other circumstances we would suggest that you can provide a donation to any of the great charities in Ireland who do work for Cancer Care or Cancer Research in Ireland. I ran in the race - but my photograph doesn't appear here in your Flickr set! What gives? ►We simply missed you - sorry about that - we did our best! You can email us petermooney78 AT gmail DOT com to enquire if we have a photograph of you which didn't make the final Flickr selection for the race. But we cannot promise that there will be photograph there. As alternatives we advise you to contact the race organisers to enquire if there were (1) other photographs taking photographs at the race event or if (2) there were professional commercial sports photographers taking photographs which might have some photographs of you available for purchase. You might find some links for further information above. Don't like your photograph here? If, for any reason, you are not happy or comfortable with your picture appearing here in this photoset on Flickr then please email us at petermooney78 AT gmail DOT com and we will remove it as soon as possible. We give careful consideration to each photograph before uploading. I want to tell people about these great photographs!